This is the true story of my baking sheet's last day of service. It all started with Ripe, in which Nigel Slater makes a couple of curious focaccias that are neither entirely sweet nor entirely savory. I'm talking about blackberry focaccia and grape focaccia. Then, on a whim and with no real plan, I bought a tub of ricotta, which I've only previously purchased as a lasagna ingredient. But this wasn't just any ricotta: it was ricotta made by the Southern Californian cheesemaker who makes the best burrata I've ever tasted. 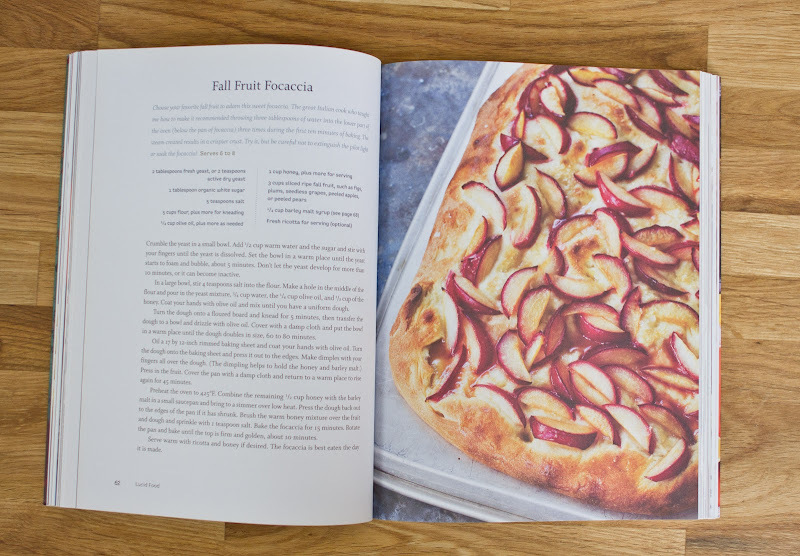 Then, later the same day, I found myself flipping through Lucid Food and seeing that she makes a not-entirely savory focaccia too and that she advises serving it alongside ricotta. You don't say. And so, this is how I came to place focaccia dough on an oiled baking sheet and then coat that dough in a layer of fruit and honey. And this is how the corners of my baking sheet, pooling with that mixture of oil and honey, turned into a black crisp mass that would never leave the surface of that baking sheet no matter how hard Bar Keepers Friend and I worked at it. But it's OK. Don't feel sorry for me, at least not about this. I had it coming. For three reasons. 1. I slightly overcooked it. 3. I don't think I really understand when to turn the oven knob to convection and when to not. If you're a regular reader, you're probably wondering what my fascination is with bready things topped with plums. 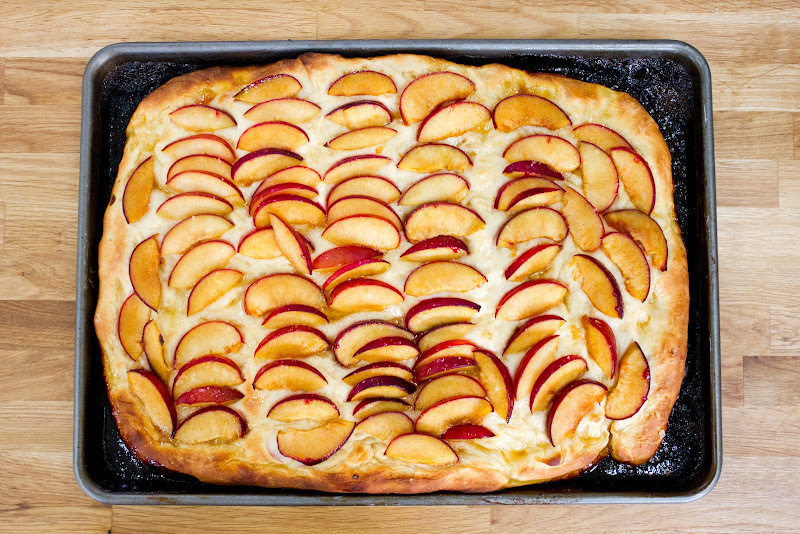 Well, in all fairness to this category of foods, the similarities between that kuchen and this focaccia end there. The kuchen was like a delicious version of some kind of semi-familiar coffee cake, but this focaccia—even burnt as it was on the bottom—was decidedly more exciting, almost soft-pretzel-esque. And highly addictive, particularly with the ricotta on the side. My advice to you, Readers? Parchment! Or, in the words of Matt, as he took his turn scrubbing the pan, "I don't understand why we don't always use parchment paper." But could we go back to the notion of feeling sorry for me for just a second? Thanks! See, my dad—a sometimes reader of this blog—once told me that the worst thing you can do is feel sorry for yourself. And despite, or perhaps, because of this directive, I've developed really strong wallowing skills, some of which I may have exhibited this week. 4. The Rattling Wall, Issue 3: Reading and Release! Crumble the yeast in a small bowl. Add 1/2 cup warm water and the sugar and stir with your fingers until the yeast is dissolved. Set the bowl in a warm place until the yeast starts to foam and bubble, about 5 minutes. Don't let the yeast develop for more than 10 minutes, or it can become inactive. In a large bowl, stir 4 teaspoons salt into the flour. Make a hole in the middle of the flour and pour in the yeast mixture, 3/4 cup water, the 1/4 cup olive oil, and 1/2 cup of the honey. Coat your hands with olive oil and mix until you have a uniform dough. Turn the dough onto a floured board and knead for 5 minutes, then transfer the dough to a bowl and drizzle with olive oil. Cover with a dampl cloth and put the bowl in a warm place until the dough doubles in size, 60 to 80 minutes. 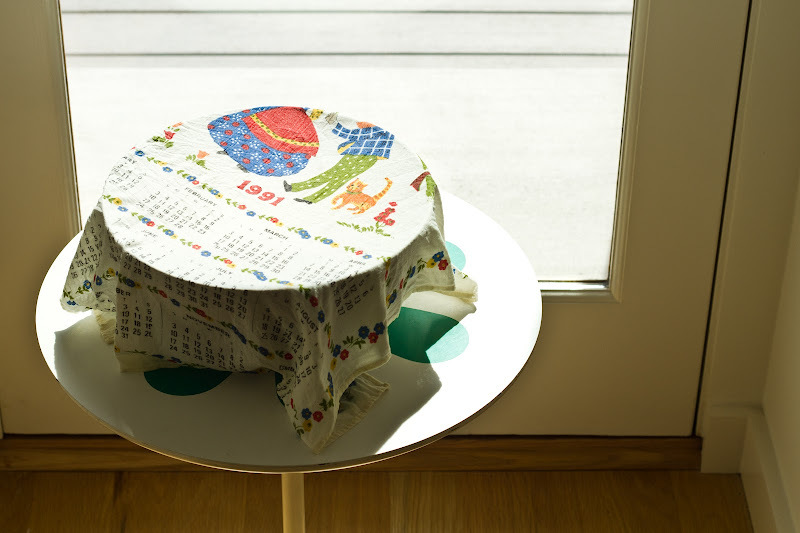 Cover a 17 by 12-inch rimmed baking sheet with parchment paper and oil it. Coat your hands with olive oil too. Turn the dough onto the parchment-lined baking sheet and press it out to the edges. Make dimples with your fingers all over the dough. (The dimpling helps to hold the honey and barley malt.) Press in the fruit. Cover the pan with a damp cloth and retun to a warm place to rise again for 45 minutes. Preheat the oven to 425F. Combine the remaining 1/2 cup honey with the barley malt (if you have it) in a small saucepan and bring to a simmer over low heat. Press the dough back out to the edges of the pan if it has shrunk. 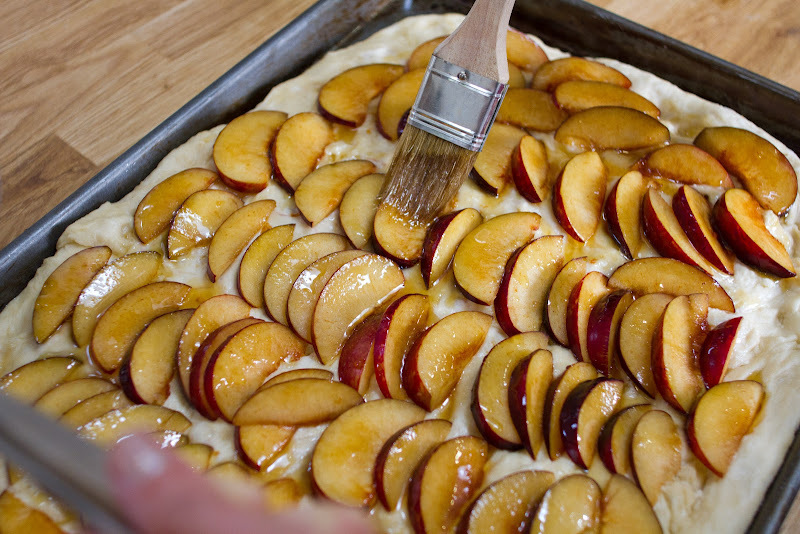 Brush the warm honey mixture over the fruit and dough and sprinkle with 1 teaspoon salt. Bake the focaccia for 15 minutes. Rotate the pan and bake until the top is firm and golden, about 10 minutes. Serve warm with ricotta and honey if desired. The focaccia is best eaten the day it is made. My oven is TERRIBLE so I get blackened, unscrubable stuff all the time. Maybe the baking sheet can be salvaged! Try mixing baking soda and water into a paste and putting it on the pan and then heating the pan in the oven or on the stove until it bubbles. It sounds weird, but this sometimes makes the burnt stuff just flake off, or at least makes it a lot easier to scrub. Last resort, try oven cleaner. It is kind of toxic but basically liquefies any baked on crud. It's mind blowing. i am OBSESSED with that solange video -- who knew she was awesome? also this focaccia looks amazing. totally worth the dumb pan. 1. You are officially an adult, when supplied with a convection oven. 2. Adults are so splendid and varied! I probably admire people who do not understand how to use their oven more than those who do. 3. Burning a pan in such a way is sort of my initiation of that pan. In my house, this pan would now be beloved. It would be promoted, on its way to being STORIED. 4. Love pretzely things! Fine work! Yum, loving this! The fruit looks so tasty...love it with the ricotta, wow! 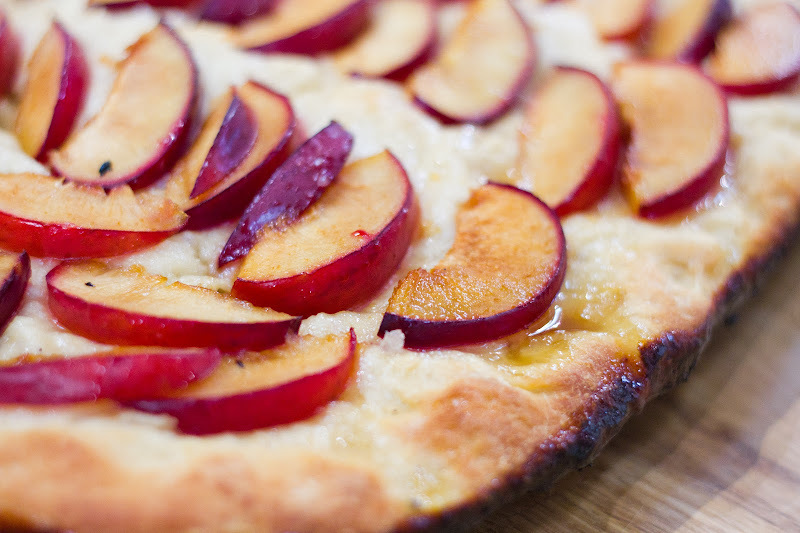 There's some mysterious magic (okay, it's called roasting) that happens to plums in the oven. I can't get enough of them. Or of your marvelous blog, with it's funny, honest, and totally heartfelt posts (and videos!). Love it! And now I desperately want to try fresh ricotta. This looks so perfect. Must try! Thanks for the links and congrats again on The Rattling Wall, I can't wait to read your story! love the post, love the Solange video. Solange knowles-- Who knew?! I'm so hungry right now! And this looks really good. I think we should all heeds Matt's advice on parchment paper all of the time! Hopefully it was time for a new baking sheet anyway. Keep up the good work, I do love your posts. OH YUM. I believe in wallowing (and bitching) when appropriate and I believe in sharing recipes like this! Can we wallow together next time please?! Louisa: it was soooo good! I want to try it again with grapes! And thanks so much for the tip. A lasagna turner?! sounds awesome. Thanks so much for this! It's so funny... It's just one of those things that since I now have, I feel like I should use. But this should help... hopefully! Solange is representing for little sisters everywhere! Karaaaa! What are we going to make when you're HERE in a few days!!! Excellent post! Good ricotta + a delicious looking pretzel-like bread. YUM-O. I would love to try this with apples. Also, parchment paper is my best friend. 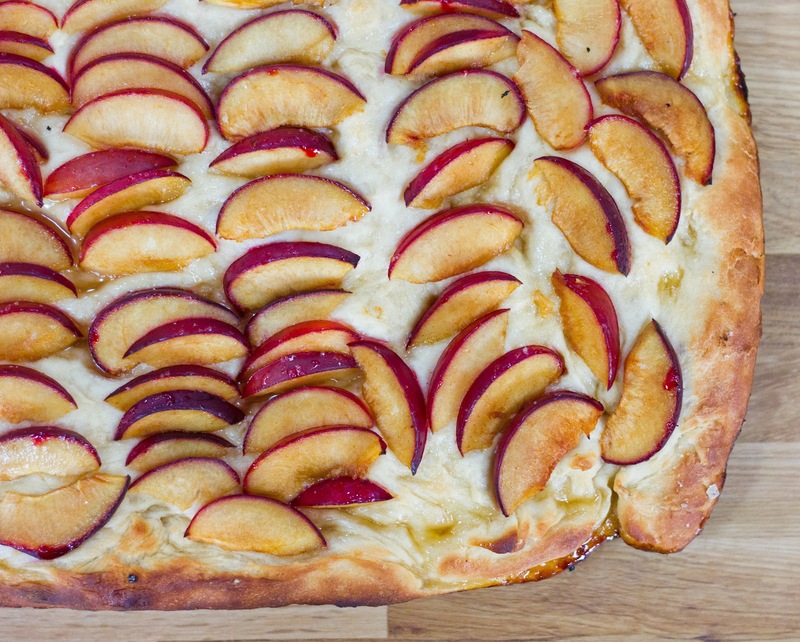 This just-sweet-enough focaccia + the fresh ricotta makes for a dangerous combination. Warning: It's highly addictive, just like this blog. This is a really interesting combo I must try. 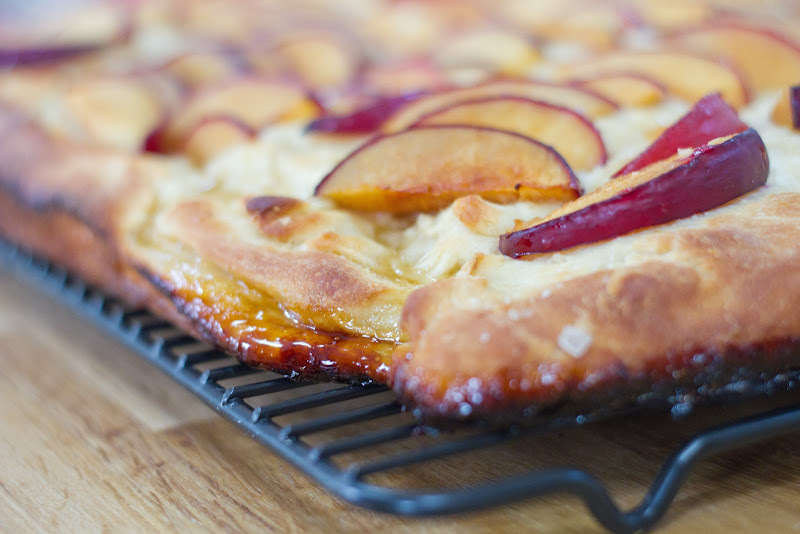 Focaccia with sweet toppings instead of savory-I must try it. Although my favorite part of focaccia is when you get a bite with a big crunchy piece of Maldon on it. P.S what was the intended purpose of barley malt syrup? I am not familiar with it. I kind of feel like you should have a donate button on here. I know I'm not alone in my willingness to kick in a buck for every foible and falter- because they make darn entertaining copy (commiserations for the tray). Hi Emily! re: barley malt syrup -- So, Lucid Food's subtitle is "Cooking for an Eco-Conscious Life." With that in mind, the author, Louisa, offers up many alternatives to processed sugar, e.g. barley malt syrup. From the book: "This sweetener made from fermented barley is thick and dark, with a mineral-like taste. It is delicious baked into bread and is a traditional ingredient in bagels, giving them their unique flavor and crust color." Hope that helps! You *are* a creative individual!!! Bready things topped with plums is about the only thing happening in my kitchen right--so you are not alone & I'm happy to have something less Eastern European to add to the repotoire! Parchment, Silpat, Aluminum Foil... whatever it takes to avoid too much elbow grease & Bar Keepers Friend. Also, for the record, aside from drying, convection ovens & I have never really gotten along. Bon Appetempt is my favorite thing on the internet. Call me whenevs you need the SLIGHTEST encouragement, ok? Damn, that Solange video is amazing! I want her clothes. Thanks for sharing that!...Yep try making this with grapes some time, that's a classic Italian thing I learned when I worked at La Cucina Italiana magazine. OH MY GOD. This looks like the best thing ever. Hi Amelia - it's Kate from the My Berlin Kitchen reading. I almost fell off my chair when I read that you mentioned me in your post. To me you are a celebrity and it took all my courage to tap you on the shoulder (ridiculous I know). I think it's because I admire what you do so much and would love to explore the creative side of myself that always gets the shaft due to other priorities. Please never stop blogging - you cheer up my weekends over coffee & granola and make me laugh. Hi Kate!!! So glad you read this post. I really really appreciated that tap! Thank you again and for the kind words you left here. Oh! A reply! How did I miss this invitation to wallow with you? Yes, please (although I hope, we are together, we can do something more fun than wallowing).